Vitamin D in Parathyroid Disease – The topic that generates the most confusion for parathyroid patients and their doctors is Vitamin D. Some of the interactions and concepts with Vitamin D are complex, but in this blog I hope to highlight a few principles that will help you understand this vitamin and its place in parathyroid disease. Example – Let’s review a pretty common scenario. Laura is a 54 year old woman recently told by her primary care physician, Dr. Smith, that she has low Vitamin D levels. Dr. Smith knows the importance of Vitamin D, so he prescribes the logical treatment for Vitamin D deficiency: Vitamin D supplementation. If Dr. Smith routinely checks a lot of different labs, he may even notice that Laura’s parathyroid hormone (PTH) level is a little high. Dr. Smith vaguely remembers something from his training about low Vitamin D levels leading to high PTH levels, and concludes that giving large doses of Vitamin D will fix Laura’s PTH levels in addition to her Vitamin D levels. Common Error – Dr. Smith has just made the most common physician error that I see in treating patients with parathyroid disease. Dr. Smith means well, and a true Vitamin D deficiency can be treated with Vitamin D supplementation. Chronic Vitamin D deficiency can lead to a rise in PTH in certain circumstances. So what was the error? To understand this, I need to back up a bit, and explain a few things about Vitamin D.
Forms of Vitamin D – There are many different forms of Vitamin D. For our purposes, there are two forms that we need to focus on. 2. 1,25-dihydroxyvitamin D (1,25-diOH Vit D). This form is the active form, and is also known as calcitriol. For the rest of the article, I will refer to this one as 1,25 Vitamin D or the active Vitamin D. This is the form that produces the effects of Vitamin D. When we talk about the role of Vitamin D in the body, we are talking about what this form does. Conversion from Inactive to Active Vitamin D – In your body, you have both inactive and active forms of Vitamin D. As you might guess, the inactive 25-OH needs to be converted into the active 1,25 form. This occurs in the kidneys, by a specific enzyme (it’s called 25-hydroxyvitamin D31-alpha-hydroxylase). The activity level of this enzyme determines how much inactive Vitamin D is converted to active Vitamin D. If the enzyme is sluggish, then not much Vitamin D will be activated. If the enzyme is fired up, then a lot of the inactive form will be converted to the active form. If more active form is created, then you will see more activity of Vitamin D. I will explain that further in a moment. What determines the activity level of the converting enzyme? – Here is a question with extreme importance, though many doctors do not know or have forgotten the answer: What determines the activity level of that enzyme? Or, put another way, what determines how much active Vitamin D is made? This isn’t just a question for biochemists, because the answer has consequences for every patient with parathyroid disease. The answer is parathyroid hormone (PTH). PTH essentially “turns on” the enzyme, telling it to speed up and activate more Vitamin D. PTH is made by the parathyroid glands. If your parathyroid glands make more PTH, then more Vitamin D will be activated. Both of these actions serve the same purpose, to increase the amount of calcium in the blood. Recap – Let’s recap the process we have so far: You have a bunch of inactive Vitamin D in your body, but it cannot do anything until it is activated. It has to be activated in the kidneys by a certain enzyme. That enzyme is always working, but will be sluggish until it gets a kick in the pants from PTH. Once PTH stimulates that enzyme, it churns through the inactive Vitamin D to make active Vitamin D. Active Vitamin D then helps your body increase the blood calcium levels. Why is PTH in charge of this Vitamin D process? – PTH is in charge because the parathyroid glands are built to regulate calcium. In fact, that is all that the parathyroid glands do: control the calcium levels in the blood. Activating Vitamin D is one of the main ways in which PTH controls calcium levels. The parathyroid glands monitor the amount of calcium in the blood. When the blood calcium level is too low, the parathyroid glands make PTH in order to raise calcium levels. When the calcium level is too high, the parathyroid glands stop making PTH, so the calcium level will fall back down. This happens many times throughout the day, without you even realizing it, and it keeps your calcium in a very tight range – if your parathyroid glands are working normally. How Parathyroid Tumor Affects The Process – If you have a parathyroid tumor, things are a little different. In this scenario, your overactive parathyroid gland with a tumor is no longer doing its job properly. It’s not carefully calibrating the amount of PTH production based on the current blood calcium level. Instead, it is just making PTH without any consideration to the calcium level. Even as the calcium level gets too high, it keeps making PTH. That PTH is going to continually activate the enzyme that produces active Vitamin D. Active Vitamin D is produced from inactive Vitamin D, so the more that enzyme works, the more active Vitamin D you have – and the less inactive Vitamin D you have. You can now see why patients with parathyroid tumors have low levels of inactive Vitamin D. All of that form of Vitamin D is being converted to active Vitamin D! If you measure the levels of active Vitamin D in patients with parathyroid disease, you will find that they are usually high. It’s worth repeating: For patients with parathyroid tumors, the level of active Vitamin D (1,25 Vitamin D) is often HIGH, because the inactive form is being converted into the active form. But this is not the form of Vitamin D that physicians generally measure. Instead, we check the inactive form. Why is inactive Vitamin D routinely checked rather than the active form? There is a reason why we routinely check the inactive 25-OH form rather than the active 1,25 form. Levels of the inactive form are more stable over a longer period of time. The active form tends to break down within a few hours, so you are getting a very brief snapshot of Vitamin D status. The inactive form gives a better sense of long-term Vitamin D status in most patients. For those who have normal parathyroid function, the inactive form is really all you need to measure to get a good sense of overall Vitamin D status. But for patients who have a parathyroid tumor, the inactive form is misleading. Most patients with parathyroid disease have low levels of the inactive form, and are diagnosed with Vitamin D deficiency. If you measured the active form, you would find that most of these patients actually have high Vitamin D (but it is in the active form). It is possible to check the active form in a blood test; your doctor just needs to request the 1,25 dihydroxy Vitamin D specifically. When most doctors order Vitamin D, they will automatically get the 25-OH inactive Vitamin D.
Back to Laura and Dr. Smith – When Dr. Smith found that Laura had a low Vitamin D, what he meant was that she had a low 25-OH Vitamin D, because that is generally what doctors are referring to when they do not specify the form. If Laura has normal parathyroid function, then her active form will also likely be low. If she has a parathyroid tumor, then it is not surprising that she has a low inactive form, because it has been converted to the active form. Here is the mistake Dr. Smith made: he didn’t check a calcium level before prescribing Vitamin D. If he had, he would have seen that Laura’s calcium level was 10.5 mg/dl, which is high for her age. Combined with an elevated PTH level, we can be certain that Laura has primary hyperparathyroidism, usually caused by a parathyroid tumor. Her parathyroid tumor is acting inappropriately, putting out more PTH than it should be. This is causing the inactive Vitamin D to be converted to the active form. Her active form of Vitamin D is likely high, but no one has checked it. Should Laura take Vitamin D supplements? Does she need more Vitamin D? No. Recall one of the main roles of Vitamin D: helping to raise the blood calcium levels. Her calcium is already high; she doesn’t need to make it higher. Taking Vitamin D (either D2 or D3, which are both inactive forms) will lead to even higher levels of active Vitamin D (which is already high!) and higher levels of calcium. Meanwhile, the inactive Vitamin D levels will likely remain on the low end – because as soon as it gets in, it is being converted to the active form. Laura needs her parathyroid tumor removed; she does not need Vitamin D.
In Laura’s case, her inactive Vitamin D is low because her PTH is high. The PTH is causing the Vitamin D to be low. But I mentioned earlier that a low Vitamin D could cause the PTH to be high. How do we know that Laura’s low Vitamin D is not causing her PTH elevation? The answer is the calcium level. If someone has a true Vitamin D deficiency over a long period of time, they will have problems with absorbing calcium in the intestines, since Vitamin D is essential for that. Calcium levels will then run in the low range (usually mid 8s to low 9s in mg/dl). Because the parathyroid glands are sensitive to calcium levels, they will start making more hormone (PTH) when they sense the low calcium. In this scenario, low Vitamin D leads to low calcium, which leads to high PTH levels. If the calcium is high, then low Vitamin D cannot lead to high PTH, and we can assume that the high PTH is the cause of the low Vitamin D, not the other way around. Another common mistake – Laura’s friend Peter sees Dr. Jones. Peter was also recently told that he had a low Vitamin D level. His physician, Dr. Jones, knew to check a calcium level, and found that it was high. She also found a high PTH. So far she is on the right track. She vaguely remembered a connection between calcium, Vitamin D, and PTH. But she incorrectly concludes that a low Vitamin D level can lead to a rise in PTH, which then raises the calcium level. This is another very common mistake I see. Dr. Jones is now under the impression that she can “treat” the high calcium with Vitamin D supplements. This logic is incorrect, because low Vitamin D causes low calcium, which then causes high PTH levels. If the calcium is high, it will suppress the parathyroid glands and cause them to stop making more PTH, regardless of what the Vitamin D level is. If the calcium is high, and the PTH is also high, then there is a problem with the parathyroid glands. Treating this with Vitamin D is not going to help, and may actually harm the patient, since Vitamin D can raise blood calcium levels that are already high. 1. Vitamin D can raise your calcium further, which can make you feel worse. 2. Vitamin D may be the cause of the high calcium, and stopping it will correct your calcium levels. Note that it may take a few months for your Vitamin D levels to drop sufficiently to see a drop in the calcium. Also remember that if the PTH is high or high-normal, then the problem is not Vitamin D. You should stop taking Vitamin D – and then see a surgeon about getting your parathyroid tumor removed. Take-home message – Vitamin D exists in multiple forms, and the one that we commonly measure is the inactive 25-OH form. This is frequently low in patients with parathyroid disease, because PTH drives the conversion of the inactive form into the active form. If you are diagnosed with a Vitamin D deficiency, the first thing to do is check your calcium. If your calcium is HIGH, with a low Vitamin D, then you likely have a parathyroid tumor. You do not need to take Vitamin D – you need to check a PTH level and may need a parathyroid operation. If your calcium is LOW, with a low Vitamin D, then you should take Vitamin D supplements. When taking supplements, be wary of taking high doses without a clear indication, and if your calcium is high, stop taking the supplement. Learn more about Dr. Deva Boone…. Dr. Deva Boone is the Medical Director of the Norman Parathyroid Center at Tampa General in Tampa, Fl. and is one of seven expert parathyroid surgeons at the high volume center that performs 4000+ parathyroidectomies per year. After growing up in New Jersey, she attended Cornell University for both her undergraduate degree and medical degree. She then trained in general surgery at St. Luke’s Roosevelt Hospital Center in New York City. While there, she received several awards for research and academic performance, including the highest award for outstanding contributions to surgical education and research. Dr. Boone received additional fellowship training in endocrine surgery at NorthShore University in Chicago. Dr. Boone joined the Norman Parathyroid Center in 2014. Dr. Boone oversees clinical research efforts at NPC and published their largest series of parathyroidectomy patients (over 20,000 from our database). She enjoys surgical missions and has provided surgical care to patients in Nigeria, Myanmar, and the Dominican Republic. We have some very exciting news about an advocacy project that we want to share with you…. Parathyroid Peeps has been invited to become a community partner on Inspire! We want to invite you to join us at ..
We are joining other foundations and communities on Inspire including the National Osteoporosis Foundation, American Lung Association & Lupus Foundation of America, among many others. Who is Inspire? Inspire, with more than 100 national patient organization partnerships and over 1.5 million members, has created one of the largest platforms for patient engagement. Inspire is a community where patients are able to receive and provide support, share experiences and information. At the same time, Inspire provides the life science industry access to the true, authentic patient voice with the goal of accelerating medical progress. As the mission of Parathyroid Peeps is to raise awareness and advocate for improvement in diagnosis and standards for surgical treatment, we believe Inspire provides a unique opportunity for our authentic patient voices to be heard! Learn more here. Inspire and the Hereditary Neuropathy Foundation(HNF) collaborated to grow the Charcot-Marie Tooth (CMT) community and accelerate medical research. HNF member discussions helped researchers understand pain as a major CMT symptom as well as the type of pain and how to develop related questions and answers that would be most relevant to the CMT community. Today, pain is recognized as a very important endpoint in CMT treatment and outcome measures in clinical trials. Patient-centric content on interesting topics related to primary hyperparathyroid disease. 24/7 professional monitoring by Inspire’s Moderators to help ensure a safe and pleasant experience in the on-line community. Content organized by categories so members can easily find threads that pertain to topics of interest. Scheduled special event Q & A’s with medical professionals and researchers. Opportunities to participate in surveys,interviews and small group engagements. Ability to join other communities within Inspires 100 national patient organization partnerships and communities. This is beneficial to those who suffer from more than one condition. Receiving and providing support to others going through similar experiences. Anonymity, if desired, to help alleviate fears about publicly sharing details of ones health journey online. Privacy: Inspire encourages members to create user names that are unrelated to the patient’s actual name, and we do too. In any case, members maintain full control of how content is shared. We encourage you to carefully review Inspire’s privacy statement prior to joining to understand the differences in choosing how you will post: Public (web), Member(Inspire platform) or Inspire friends. Learn more here. How is the public information that is shared in some Inspire communities potentially used? 1) Insights:Life science executives face mandates to include real world evidence and expand the role of patients in modernizing clinical trial design, determining new indications, creating outcomes measures that patients’ value and assessing treatment risks. Learn more here. 2) Research / Clinical Trial Recruitment: Nationwide, some three-quarters of clinical trials do not meet their enrollment timelines. Inspire helps link them to patients who are looking for opportunities to participate. Learn more here. 3) Engagement: Members may at times be invited to participate in surveys, interviews and small group engagements. Learn more here. Read more about Inspire in the News AND discover the Experts by Experience Series – a collaborative effort of the Mayo Clinic and Inspire. I’m 56 years old — and it seems like another lifetime ago that I was forty, single, working a job I loved, and enjoying good health. While not especially athletic, I still participated in equestrian sports, cycling, and weights. I worked full time as a library reference department head in an academic library. Life was good! My workplace covered twice-a-year bloodwork which proved valuable to early diagnosis. I got regular bloodwork to monitor mild anemia but otherwise nothing unusual. In the fall of 2002 though, my results came back with a new anomaly. My calcium level was slightly elevated — 10.4 (reference range 10.2). I figured it was a mistake, or a fluke, maybe I was dehydrated? I had no symptoms, so it was easy to rationalize. That spring it was just a tad higher, 10.6, so off to the doctor I went. My GP didn’t seem too concerned but sent me to both an ear/nose/throat (ENT) doctor and an endocrinologist. As you might guess, a battery of tests ensued. While I don’t recall all of them, who could forget the 24-hour urine collection, and lugging a gallon of pee to the hospital? I’m sure more blood was taken to test parathyroid(PTH) and thyroid (TSH) hormone levels; I had a Dexascan to assess bone density; and an ultrasound of my neck was performed. The main findings were that my PTH was high, by about 30-40 points, and I had low bone density (osteopenia). Not. Good. You may know this already, but I’ll mention this because for me, it was a big deal. Wonky PTH levels can mess with your bone strength. PTH does a lot of things, I suspect, but it tells the bones to release calcium, which then goes into the bloodstream. When PTH levels are normal bones maintain an optimal level of calcium. When the PTH level is too high, bones release calcium, which weakens the bones. The released calcium goes into the bloodstream among other places, and that’s why high blood calcium is a symptom of PHPT. Another symptom which is “silent” is low bone density. There are lots of reasons you might lose bone density, but this is one of them. My diagnosis was PHPT and osteopenia (low bone density). Three doctors weighed in, and their advice was all over the map. My GP was skeptical that I had PHPT — it’s not a “young” person’s disease. My ENT said surgery wasn’t needed for levels this low. My endocrinologist, who in retrospect was the guy who knew his stuff, wrote polite but pointed letters to all of us explaining the professional guidelines for PHPT treatment — that at my relatively young age, with calcium likely to increase and side effects likely to worsen, surgery is indicated. I was confused, if not a little freaked out, by these varied opinions. As a librarian I had research tools at my disposal — time for some DIY medicine! I obtained a book from the UPenn Libraries, entitled something like The Big Book of Parathyroid Disorders. I read it cover to cover. I also did a citation analysis to find out what universities contributed the most to the field of thyroid/parathyroid research. Fortuitously, that institution had a Thyroid Center with a patient hotline. The advice from the surgical nurse who worked the line: “Go to the best. You don’t want a surgeon that does three of these surgeries a year, you want someone who does at least fifty.” And she was quick to point out that one of the best surgeons in the country was in my backyard. At the time, Dr. Douglas Fraker at University of Pennsylvania (UPenn) had a near-100% success rate with first surgeries. He was the go-to guy for second surgeries (when the first surgery fails), and people came to him from all over the country when their first surgeries were botched. I remember the consultation, Dr. Fraker’s confident and genial manner, and more tests. He ordered some sort of scan (nuclear?) that localized the “problem gland” among my parathyroid glands. I made the one-hour drive down to UPenn and had the surgery. I remember post-op Dr. Fraker telling me that he had some trouble localizing the problem parathyroid gland tissue, but that the surgery was successful. I went home the next day with a teensy scar and normal calcium levels. Within a week I was back at the gym, and for fourteen years my calcium and PTH levels remained normal. It was a textbook good outcome. I continued to get regular bloodwork. In about 2015, I sort of knew something was percolating with my parathyroids. My blood calcium started to rise, and with each test I saw a slight increase in serum calcium. Finally, in 2017, it hit 10.4. I went back to my endocrinologist in October of 2017. It was all too familiar. We did repeats of most of the tests I had in 2002. This time my PTH level was high normal, but the Dexascan was alarming — my T-scores showed a dramatic decrease in bone density — I had osteoporosis, even in the forearm, which usually doesn’t lose density. Apparently bone-thinning in the forearm is a sign of parathyroid issues, so if they suspect you of having PHPT, they may order a Dexascan that includes the forearm in addition to hip, spine, etc. Based on the overall picture the tests revealed, a recurrence of PHPT was suspected. But this time it was a bit more complicated. A nuclear scan and an ultrasound failed to reveal an area of concern or localized tumor. Second surgeries are tough, in part because there is scar tissue from the first surgery that obscures the structures of the neck. Surgeons don’t like to just “go in and explore” the neck, in part because the vocal cords,thyroid, and the jugular vein are delicate and easily damaged. In these cases, nuclear, ultrasound, and other scans are critical to finding the overproducing tumor’s location to aid the surgery. I was in a bind. Surgery in the absence of a known tumor could be risky, but at the same time with my osteoporosis a “wait and see” stance was risky too. I needed to find a surgeon and as before, I contacted UPenn. Dr. Fraker had left UPenn just a few months earlier to assume a position at Rutgers U. I immediately started my own research to find a surgeon and ultimately decided to stay locally when I learned that Dr. Rachel Kelz at UPenn was Dr. Fraker’s protege. I scheduled an appointment with her. Not many places do the 4D scan, and even with a list of hospitals that do it, calling to schedule the appointment was a challenge. No one in the scheduling pool knew what it was, and even when I arrived for the appointment, the technician seemed to be confused when I tried to get confirmation that she’d be doing a 4D scan. She was on the phone for a half-hour getting directions from someone; it took so long that while sitting on the scan table, I started to make calls to UPenn to make sure the paperwork was right. When they finally did do the scan, it was over so fast I wondered if they had captured that time dimension. I was not expecting a good result. At last we’ve found you! The 4D scan did it! The upper right portion of my neck showed a tiny piece of gland/tumor that appeared to be tucked behind the thyroid, presumably overproducing PTH. Dr. Kelz was able to review Dr. Fraker’s notes from over a decade before. He had removed tissue from that area, and in the scan you could even see the sharp edge where the scalpel had been, right next to the tumor. Dr. Kelz posited that there may be a second lobe of the gland that was hidden in the folds of the thyroid and missed in the first surgery. We scheduled the surgery. On the day of the surgery, I was waiting in pre-op when a familiar face peered into my room. Dr. Fraker! He had returned to UPenn (returned to his former position!) and would observe at my surgery while Dr. Kelz operated. After the surgery, Dr. Kelz told me that they had found a tiny tumor/node very close to the previous surgical site. They were even able to compare the tissue removed in 2018 to the lab slide from 2002 — same tissue — so this was not a new tumor/node, it was a tiny (leftover? microscopic?) piece of the original tumor that was removed in 2002. I guess it grew oh-so-slowly and over time bumped my calcium back up. When I left the hospital, my calcium level was 8.4 and it has hovered around there ever since. My surgical scar is about the same as it was in 2002 — barely noticeable. While I was sore the first day, I recovered quickly. Two weeks after my surgery I ran in a half-marathon! I’m taking Fosamax for osteoporosis, a tough decision since new research shows some adverse effects of Fosamax for some folks that take it. In the end, though, my endocrinologist convinced me that the low risks of these problems (which occur mostly in folks taking Fosamax more than three years) is more than offset by the risks of a broken bone. Fosamax reduces the incidence of bone breakage — so I’m on it. With any luck my bones may rebuild what was lost in the years I had a hormone imbalance. Get informed. Don’t rely solely on your doctor’s knowledge/experience. You can search the Web, but stick to the research. Be wary of anything but clinical research reports, or journals summarizing them. Go to the best. This is tough, because some insurance limits where you can go. Consider asking your doctor to write a letter advocating that you go out of network, if necessary. It will be cheaper than a second surgery, and better for your quality of life. Speak up! Ask questions, and don’t worry so much about offending your health professional. They’re tough, they can take it. Thanks for reading my story, and I wish you all the very best. Stacey worked as an academic reference librarian for many years before entering higher education administration. An avid equestrian, runner, cyclist, and writer, she occasionally posts to her blog behindthebitblog.com. She enjoys beadwork, all kinds of music, spoiling her cats, and travelling with her husband Bob. Today we had the pleasure of chatting with Dr. Courtney Balentine about research he is leading entitled, “Failure to Diagnose Hyperparathyroidism in 10,432 Patients With Hypercalcemia: Opportunities for System-level Intervention to Increase Surgical Referrals and Cure” , Balentine CJ, Xie R, Kirklin JK, Chen H. The research has promise for improving diagnosis of primary hyperparathyroid disease. You can read a summary of the paper here. We are excited for you to hear directly from Dr. Balentine about the findings and next steps. Earlier this month my 6th Grader came home with her biology homework. As she was reading out loud her assignment called ‘Feedback Loops’, I realized that it was about the functions of the parathyroid glands! And there is was, an explanation of how your 4 parathyroid glands function and how they monitor your calcium levels and produce parathyroid hormones (PTH). I have to admit that I was blown away (and elated I might add) that a teacher would bring the parathyroid gland topic to a class full of 6th graders. My daughter’s reaction upon reading the article was to ask me why the article didn’t mention anything about parathyroid tumors. This made me smile…that’s my girl! I explained to her that her assignment was about the roles of the 4 glands, not to diagnose someone whose parathyroid glands are over producing PTH. Can you imagine if kids in the US learned about possible dysfunction of the glands and parathyroid tumors in 6th grade? 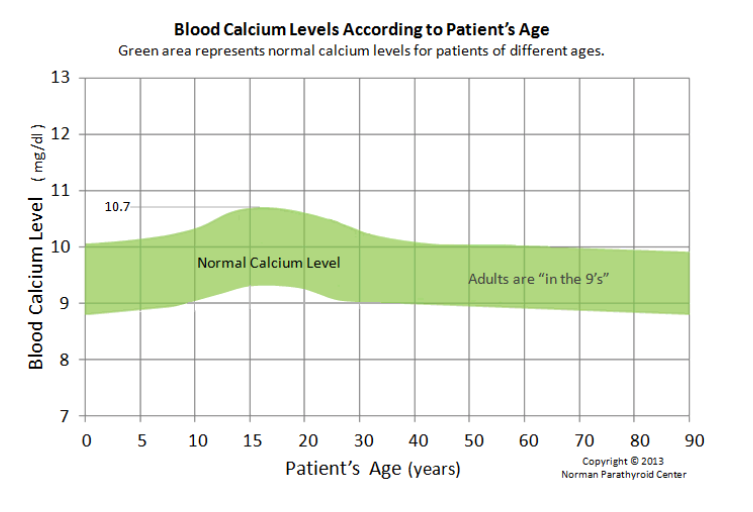 OK, back to reality now from wishful thinking – but I did tell my daughter to please specify on her assignment that the normal calcium levels are age dependent and that a mature adult should always be in the 9s (see chart on the left). That’s how a mature adult would know they have perfectly nice performing parathyroid glands! Everyone needs to know the highest level of normal calcium value for their age. This school assignment is making me hopeful that the role of parathyroid glands is not some obscure topic and that biology teachers in our country are indeed paying attention to our calcium levels. I am also hopeful that in the near future all our doctors will be educated on the ‘feedback loops’ and will recognize early on, the signs and symptoms of parathyroid disease, so no one is left untreated for years! In 1971 I’d booked a holiday to Tunisia. But fate intervened and I finally came to Greece with some friends. Four days before we were due to return to England, I met someone….10 months later we were married! So now I’ve been living in Greece for 45 years. The culture shock in the beginning was huge, and not knowing a word of the language didn’t help matters. But over time one adapts and embraces a different way of life. It’s a beautiful country, with the sea never too far away, islands that often seem to belong to the past, magnificent mountainous scenery reminding one of the Alps, and of course treasured ancient monuments. As far as health care is concerned, despite the problematic economic condition the country is in, Greece has many excellent doctors of all specialisations who strive to do their best. But as we all know, some are more knowledgeable and experienced than others…. My parathyroid story is pretty typical: after years of having high calcium, osteopenia, crystals in the bladder- all measurable symptoms – and other more subtle ones such as muscular weakness, intense exhaustion, red eye, severe vomiting, weight loss, etc, – I went to an orthopaedic specialist for a referral for my annual Dexa scans. And I asked him this life-changing question: “Are there any other useful tests that I could have?” He thought about it and then sent me for a PTH test…the first time I’d ever heard of the parathyroid glands. The result was 143 pg/ml, with the upper limit being 65 pg/ml. He told me to see an endocrinologist. So for nearly 5 years I went to a professor of endocrinology, and every 3 months he sent me for a huge range of tests…blood, scans, Xrays, urine….Although he diagnosed me with hyperparathyroidism, since nothing ever showed up on the imaging tests he was hesitant to recommend surgery since he feared I’d develop hypoparathyroidism which would be extremely serious. All this time my symptoms were getting worse and there were days when I could hardly get out of bed. Of course I wanted a second opinion, but where to go? I knew of nobody who had the disease, and was reluctant to start doing the rounds without useful results. In November 2015, fate intervened again: someone I knew and respected had gone to a new endocrinologist and highly recommended him, so I went to see him. He immediately appreciated the gravity of the situation, sent me for a few more tests and then recommended an incredible surgeon. When we met him, he explained that he couldn’t give us a 100% guarantee that he would be able to locate the bad gland or glands, but felt pretty confident that he would. And he did: one adenoma was deeply embedded down the back of the neck, and the other was ectopic, clinging like a leaf to the oesophagus. My good fortune continued: I was one of the estimated 20-30% of sufferers who have an extremely rapid recovery post op. 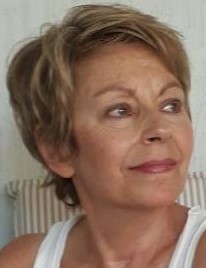 My photo shows me and my scar….my little smile on the neck! I have been so lucky…. However, it was only about 2 weeks post op that I ventured into the world of Facebook to investigate hyperparathyroidism: up till then I had only dabbled…I joined a couple of groups and my eyes were opened. Such pain, suffering and despair, isolation, insufficiently knowledgeable endocrinologists, insufficiently experienced surgeons…and the list continues. It’s one thing reading information from Dr Google, but quite another to hear directly from the sufferers. I felt I had been extremely fortunate that, after a number of difficult years, I had been able to have a successful parathyroidectomy in Greece and wanted to try to promote general awareness. This is not an easy task at all, and I sincerely hope that you will spread the word about our little group far and wide! It is in English and Greek and we welcome people from other countries. At the moment we have about 57 members, more than half of whom are not from Greece: information and support should be international. It is incredibly hard to find Greek sufferers and at times I wonder if we ever will! So please spread the word…we need all the help we can get. Reflecting about how much sooner many of us could have been diagnosed if any of the numerous doctors we usually see during our parathyroid journey had picked up on our symptoms I wrote the following article. It is up to each of us to ask “WHY? ?” and at every opportunity inform others about the disease. Since you are reading this, you already know something about Hyperparathyroidism even if you are not yet certain that you have the disease. Or you may be here to help a friend or relation. But even if you have been tested for PTH and calcium, you may not yet have a definite diagnosis. Think about the symptoms that this illness can often cause: for example, kidney stones; gravel/crystals in the bladder; osteopenia/osteoporosis; red eye; gallbladder and pancreas issues; depression; brain fog; weight gain/loss; intense exhaustion; muscular weakness; bone pain; dental problems; and many more…. So start asking the doctor WHY? WHY do I have this problem? Could it be because I have hyperparathyroidism? Could you give me tests to check my PTH and calcium levels – just in case? When you chat to friends and relatives, and you hear them complaining about health issues that might be related to Hyperparathyroidism, tell them about the disease and advise them to get tested so that if they do have the illness, they won’t waste years of their life suffering unnecessarily. And to those of us who have been diagnosed and had the operation: ask yourselves this: if you had known about hyperparathyroidism before, and had started to ask the doctors WHY you had such symptoms, how much sooner do you think you might have been cured?